The remarkable folded coastline of the Cinque Terre (Five Lands) stretches between the beach resort of Levanto and the port of La Spezia. It encompasses five impossibly beautiful tiny villages – Monterosso,Vernazza, Corniglia, Manarola and Riomaggiore – which are spectacularly wedged into a series of coves between sheer cliffs – their comparative isolation, and the eye-wateringly dramatic nature of their positions, makes Cinque Terre the scenic highlight of the whole Riviera and also one of the most beautiful places to visit in Italy. Our guest blogger Sonal Sarin, an ex-Googler, mother of two young kids visited and was captivated by this extraordinary corner of Europe…. Italy’s rugged Ligurian coastline seriously the stuff that dreams are made of, so, on our trip to Italy, along with the usual rounds of beautiful Tuscany, we decided to visit Cinque Terre. Five fishing villages set along dramatic scenery and coastline were accorded the UNESCO World Heritage status in 1997. They look exactly as all the ubiquitous photos taken of them – colourful, quaint and simply stunning in a pastel hued perfection! 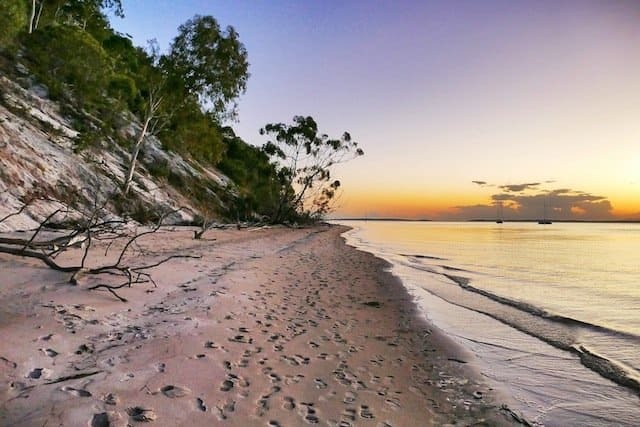 There are a gazillion hikes and trails there to be accomplished and gorgeous coastline to explore, but a word of warning – it’s going to be hot, especially during the summer months, so be prepared! Summers are high season at Cinque Terre – booking much in advance will help nail down the best options. While there are many hotels and backpacking hostels in Cinque Terre area, most are largely unspectacular. Also, driving is tough on the narrow and very windy roads and almost all villages had very few parking areas. The good news is that the villages are very well connected via local trains and buses with reasonably high frequency. Getting from one village to another is 5-10 minutes train ride. Also, one has the option of using ferries – again, reasonably good frequency. Since we were travelling with our kids, we wanted to be in a largish town and chose to make La Spezia our base. We found a very nice Agriturismo property on the outskirts that became our home for the two nights and three days. The experience of being hosted by locals in densely green farms was wonderful. Everyday, we woke up to freshly made croissants, pastries, fresh juice, home made jams, marmalade and eggs to order. Kids had a great time roaming the farm and interacting with the animals. 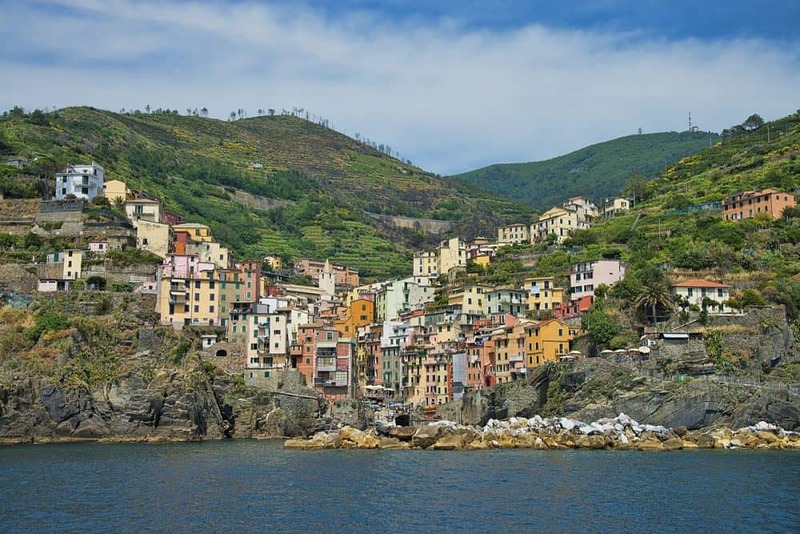 They gave us excellent tips to maximise our experience in Cinque Terre.We left each morning – drove up to the train station and took a train to the villages and navigated our way from there. Tip: The Cinque Terre Pass covers all train travel between La Spezia (closest to Riomaggiore) to Levanto (closest to Monterosso) and is good value. All villages have steep walking tracks and lots of steps, so be sure to be dressed in comfortable attire and walking shoes. Throw in a water bottle, beach towel, beach gear and sunscreen in a bag and you are all set. The train stations are mostly at higher points in the village with cobbled paths leading you down to the village centre. A note to parents of young kids – baby carriers may be better than prams given the paths and steps. There are a bountiful supply of walks and trails to be explored. All trails are graded and it is fairly easy to assess which ones to undertake. There are enough trails for experienced and inexperienced hikers alike. Most of these trails had been painstakingly carved in by the village folk before the train lines could access the villages. Many of the trails can be accessed for free but some good ones need a pass. Be sure to buy them at the visitor centres (available at all train stations of the villages) and get them validated before you head out. 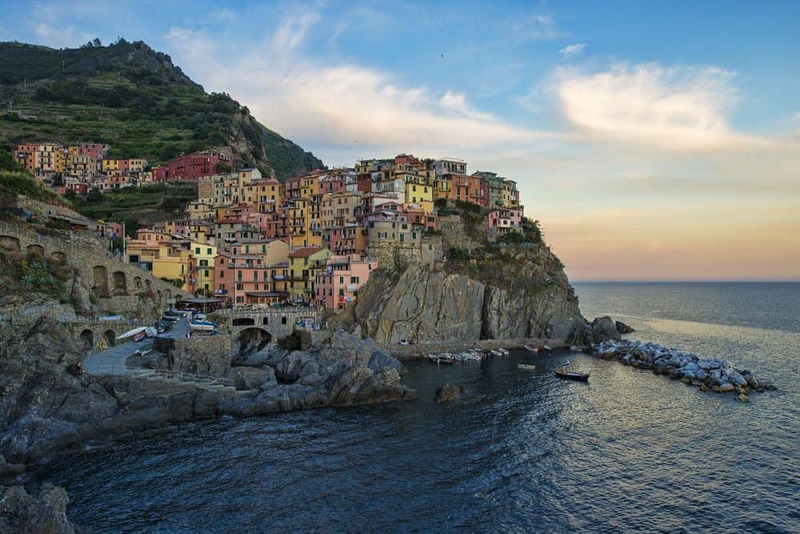 We started with Manarola – the prettiest of all villages. After winding our way down the colorful village, we grabbed a quick cup of coffee and gelato for kids, and dipped our toes in the water. There is a small harbour in Manarola, so it makes for a good pool. But the water is deep and caution needs to be exercised. It was fun to watch people dive into the azure water or just lazily sun-bathe on the rocks. Do note that there are no locker rooms etc so go prepared accordingly. I did see some kids washing off under a small tap. The mood was upbeat and people were having fun making do with whatever was available. After a bit of splashing around, we decided that we wanted to go for a short hike and walked back up and took the bus to Vernazza. We got off at Volastra, a tiny hamlet near Vernazza, and walked up to Prevo, the highest point in the Cinque Terre National Park. 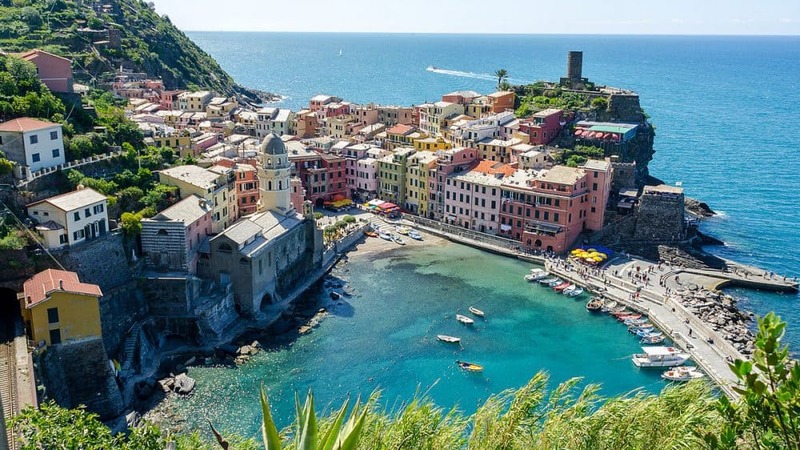 It is also the mid point of the Corniglia -Vernazza coastal trail and lends itself to stunning view of the villages. The whole trail is quite strenuous and requires a hiking background. We walked between the olive and grape vines for a short while before making our way back. While the hike itself is safe, there are no fences and therefore, one has to be very watchful with small kids. After arriving back at Manarola, just in time for the sunset, we headed out to Punta Bonfiglio, a small playground for the kids offering prized views of the sunset. It always makes me muse that Sunsets are such easily available but rare experience at the same time. How often do we take time to enjoy the beauty of the light show that nature puts up for us? Thanking my stars for the time and peace of mind to enjoy this – we headed to the playground. The kids frolicked in the playground while we waited our turn at the very popular NessunDorma bar and restaurant. The place had excellent views, great music, fun vibe and nice food. The servings were huge and we particularly enjoyed the seafood, pesto preparations and bruschettas with multiple kinds of toppings. We kicked back and enjoyed wine while soaking in the beauty around us. Thoroughly spent, we made our way back to the train station to catch our ride back home. The next day we started at Riomaggiore, the largest of the five islands. It is less crowded than the others maybe because the beaches were rocky. It is stunning nonetheless. We made our way to the famed Via dell’Amore, a kilometre long trail linking Riomaggiore and Manarola. 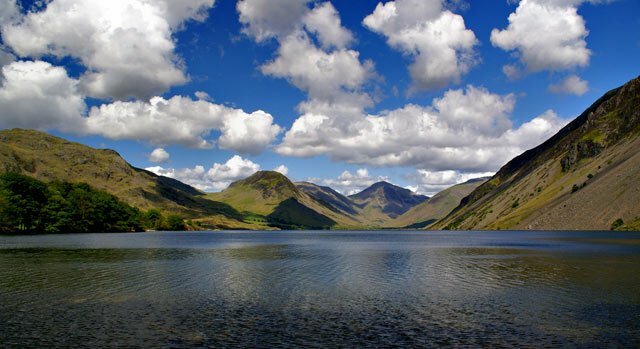 It is easy for beginners and does not require prior hiking experience. Unfortunately, a massive landslide destroyed the path and we were allowed to walk only 200 metres. The re-opening date is tentatively set to 2019. The little that we saw was gorgeous. After our coffee break we decided to hop on a ferry, cool off a bit and head to Vernazza. It is the only island (in Cinque Terre) that has a natural harbour. It is also probably, the steepest of the five. Most would argue that it is by far the prettiest as well. Unfortunately, the floods in 2012 raised it to the ground. While most of it has been restored, the extent of devastation can be seen in the many photographs that line the cobbled streets. 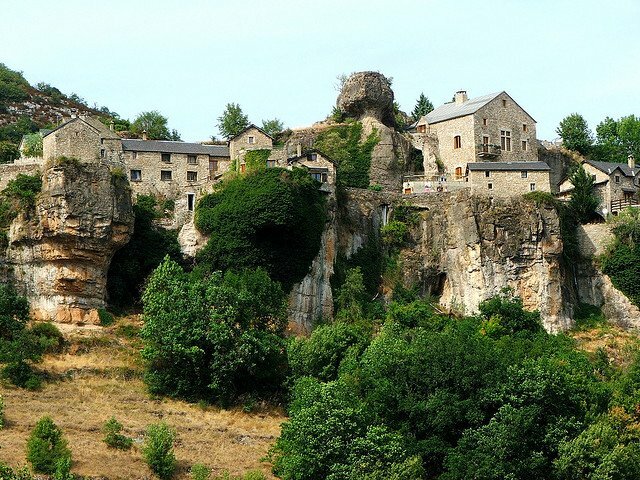 The location and terrain adds to many complexities of the restoration work. As we strolled thru the village and the kids gamboodled around, we came across a delicious Foccaceria called Batti Batti. It offered some of the best Focaccia slices I have ever had and bountiful pizzas too. After grabbing our preferred slices, we made our way back to the sea facing amphitheatre Piazza Marconi and enjoyed yet another gorgeous sunset. Kids were busy throwing pebbles into the water. I looked at them and wondered that no matter where one goes, kids always find ways to make themselves happy even when they are tired and exhausted – such a nice way to live life! This village is the most commercial of all. It has tons of hotels and a pocket size beach. It is known for its anchovies and is the most easily accessible by car. We lazed on the beach a bit and gave the kids some time to knock themselves out on the sand. We were so spoilt by all the other villages that seeing so many hotels was a put off! 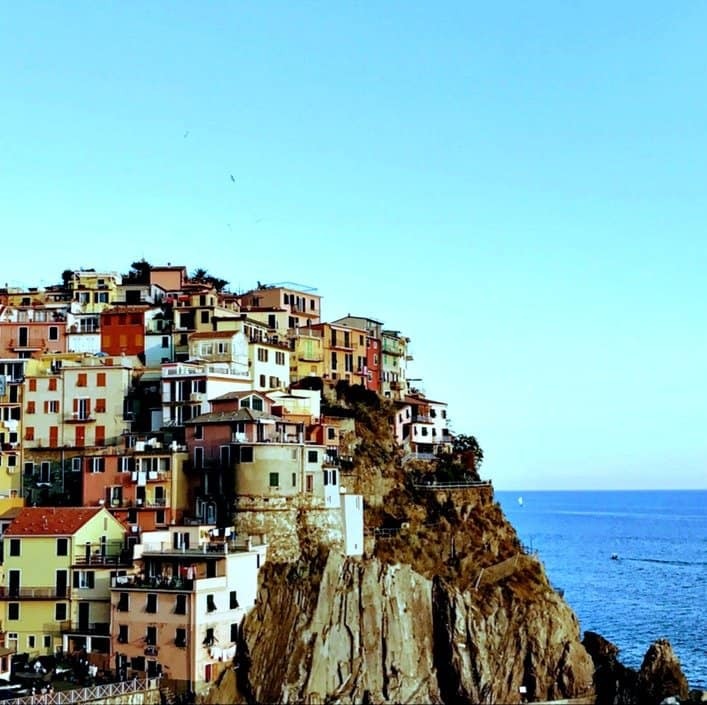 Corniglia is the only village that does not have direct access to the sea. Though, it has a beautiful and breezy sea facing terrace. We decided to skip this one for the paucity of time. As we headed back on our train to La Spezia, I looked at the stations whizzing by and bid adieu to the colorful boats and more colourful locales. Perfection in a holiday! All words and most images by guest blogger Sonal Sarin. Sonal is an ex-Googler, mother of two young kids, who is currently enjoying time with her family and basking in the Californian sun. Her favourite destinations are New Zealand and Norway. 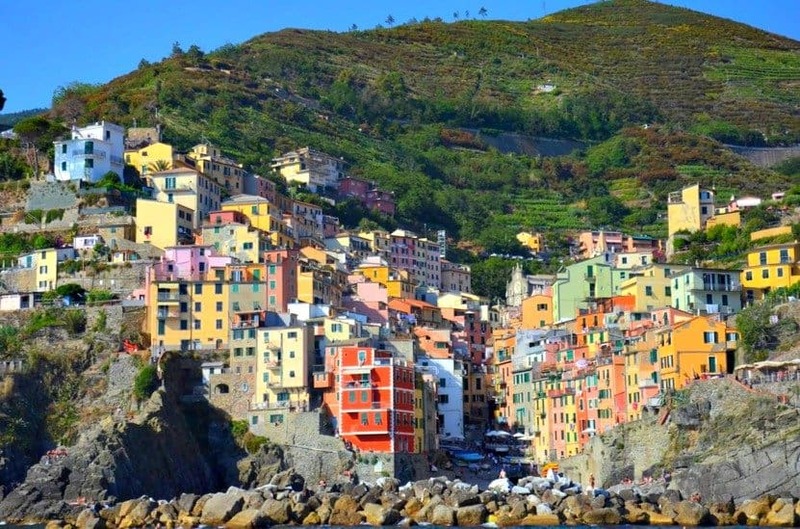 I absolutely love the Cinque Terre and luckily I live only 2 hours away! So I go there regularly, my favourite viillage is definitely Riomaggiore, not as overrun as Manarola but absolutely beautiful! This is a such great guide! Looks like a truly beautiful place to find peace! Wow, so pretty and great tips for a wonderful stay too thank you so much! 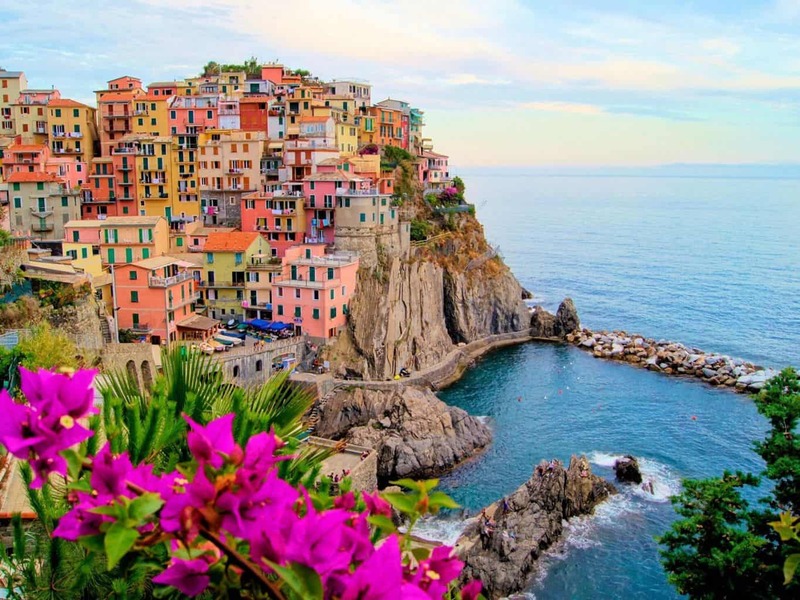 Cinque Terre is now on my travel list! Loving the photos in this post, this reminds me that I need to visit more of Italy one day soon, especially this place!